E5C096EB-251F-43A7-94B5-91292574E32D@riseolsen.dk”> Any time that you are away from your computer, it’s a good idea to lock the screen. This provides a level of privacy and security to the Mac that is very easy to use and implement and it should be considered a must-use trick, particularly for anyone working in public spaces, offices, schools, or anywhere else that there is potential of an outside party accessing the computer. The fastest way to lock the screen of any Mac OS X computer is to use a simple keyboard shortcut. We’ll walk through exactly how to set up the lock screen feature and show you the keystrokes to use to instantly lock the Mac, thereby requiring a password to be entered before the machine can be used again. You can easily confirm the setting is now functioning by hitting the locking keystrokes for your Mac model, which will make the screen go black instantaneously. 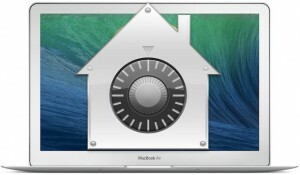 If you chose the immediate option in Security preferences, then you will need to enter the user password before being able to use the Mac again, the option to wait 5 seconds gives you a few seconds of allowance before requiring the password, which may be more desirable in some situations. You’ll probably have noticed that other choices are available in the timing, but realistically anything higher than a minute starts to lose it’s security benefits, thus the shorter times are most desirable for optimal security and privacy purposes. B8BF9A4A-6AB9-4D2B-ACD2-564C8F61A6F1@riseolsen.dk”> The Mac OS X lock screen is the same as what you see when you wake a Mac from sleep or a screensaver when this feature is enabled, so remember that if you use a screensaver that auto-activates or sleep your Mac regularly, you’ll also be entering your password when it is woken. Now you can test this out by dragging the cursor into the hot corner you just set. The display sleep method turns the screen black, while the other begins whatever screen saver is set. Assuming you set “Immediately” as the initial password requirement, any motion of the mouse will summon the login screen and require proper login credentials to unlock the Mac again. It doesn’t matter which method you use to actually lock down the screen, just make it a habit. This is highly recommended to enable on any Mac, but particularly for those in offices, schools, public places, and any other environment where you may have sensitive data on your machine that you want to keep from prying eyes. Another very worthwhile endeavor is to add a login message to Mac OS X, which can include things like identifying information of the Mac, or better yet, ownership details like a name, email address, or phone number. Nonetheless, the setting and keyboard shortcuts are the same regardless of the version of OS X, and the Hot Corner will work as well universally. Remember the password otherwise you will not be able to easily access the computer. If you do wind up in a situation and happen to forget your Mac password, you can reset it through a few different methods. Det er denne knap du skal trykke på, hvis du vil opsige dit abonnement på Apple Music. 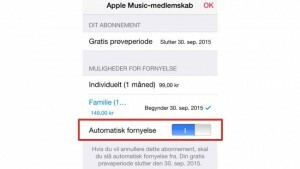 Se her hvordan du slår den automatiske fornyelse af dit abonnement på Apple Music fra – dvs. opsiger dit abonnement. Læs mere her. Nu har Apple Music kørt i næsten tre måneder. Har du været med fra starten, er din gratis prøveperiode derfor ved at udløbe. Med mindre du aktivt gør noget, vil du automatisk skifte til et betalt abonnement, og få trukket penge på dit kreditkort hver måned, når prøveperioden ophører. Se her hvordan du slipper for at abonnere på Apple Music, hvis ikke du har lyst. 2) Tryk på profil-ikonet øbverst til venstre. 3) Tryk på “Vis Apple-id”. 4) Log ind med dit kodeord. 5) Tryk på “Administrer” under “Abonnementer”. 6) Slå “Automatisk fornyelse fra” og bekræft dit valg. Du har nu slået den automatisk fornyelse fra, hvilket i praksis svarer til at du har opsagt dit abonnement. Du vil derfor selvfølgelig heller ikke have adgang til Apple Music, når prøveperioden er udløbet. When Apple first shipped the Apple Watch earlier this year, its software wasn’t capable of Activation Lock—the technology that Apple uses to prevent someone from activating a lost or stolen iOS device without first validating ownership. Activation Lock is a feature that first appeared with the introducion of iOS 7. It works by preventing an iOS device from being activated after being reset without first disabling Find My iPhone. 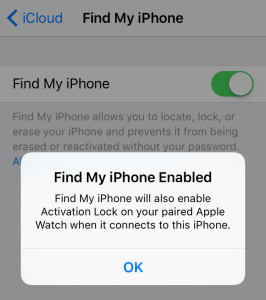 By enabling Find My iPhone, a user is effectively enabling Activation Lock, therefore providing a layer of protection against would be thieves. When we first reported that Activation Lock didn’t ship with watchOS 1, many users were perplexed. Why wouldn’t Apple include such a feature in its popular wearable? After all, Activation Lock has been credited with reducing iPhone thefts by as much as 50% in some regions. While we never were told exactly why Activation Lock didn’t ship with watchOS 1, chances are that it just wasn’t ready at the time. With watchOS 2, however, things have changed. As Apple promised back at WWDC 2015, Activation Lock is included with its latest watchOS update…and it works. If you’ve yet to update to watchOS 2 on your Apple Watch, you’ll need to do that first. 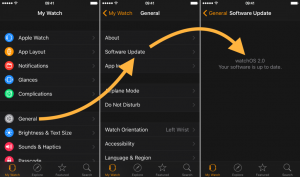 Learn how to update to watchOS 2 using this tutorial. You can sign in with your Apple ID during the initial Apple Watch setup process, or you can do so after the fact in Watch → My Watch → Apple ID. You must enable Find My iPhone on the iPhone that is paired with your Apple Watch. To do so, go to Settings → iCloud → Find My iPhone and enable the Find My iPhone switch. 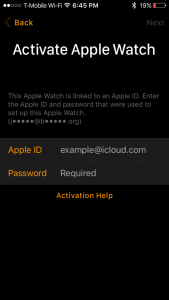 Enabling Activation Lock by following the above steps means that your Apple Watch is essentially worthless if stolen. Similar to iOS, a thief would have to correctly guess both your Apple ID and password in order to bypass the activation screen that appears after resetting an Activation Lock-enabled Apple Watch. The chances of that happening are slim to none. So unless the thief can figure out your Apple ID user name (Apple truncates this for added security) and your Apple ID password, the Apple Watch can never be activated, and as such, it’s effectively worthless on the resale market. With watchOS 1, this wasn’t the case. A thief could simply factory reset the Apple Watch with a couple of button presses and pair the Apple Watch with another device. 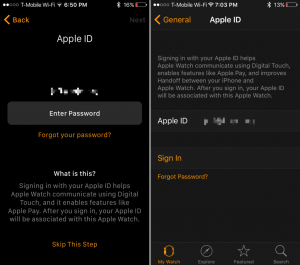 With watchOS 2, the Apple Watch can still be just as easily factory reset, but if Activation Lock was previously enabled, it can’t be paired until the Apple ID and Password of the last paired device is validated. 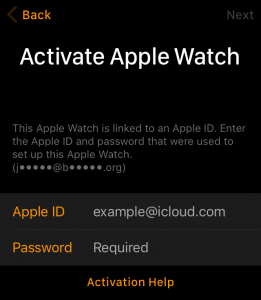 Apple has made good on its promise to add Activation Lock security in watchOS 2. Now it’s up to Apple Watch owners to take advantage of said security. E5562868-371C-4B8D-AB5E-F310FAD60DAA@riseolsen.dk”> We’ve all been there; you want to change a setting on your iPhone, iPad, or iPod touch, but you can’t remember where that preference or option is located in the Settings app. Fortunately, thanks to a search feature built into the Settings app of iOS, you no longer have to wonder and poke around to find a particular setting, you can just search for it by typing it into a hidden settings search box. Settings Search requires iOS 9 or later, and as mentioned, similar to the general Search feature in iOS, it’s somewhat hidden, so don’t be surprised if you haven’t seen the search box within the Settings app yet. Not to worry, it’s easy to use, and we’ll show you how to access this handy feature. You’ll notice the search results also have the path to the setting within the Settings app itself, which can make this a useful assistance tool for locating where an option is located and either memorizing it yourself, or relaying that to someone else. This is obviously much easier than fishing around aimlessly for a given setting, particularly since some settings are spread throughout iOS Settings app and not always in the most obvious locations. 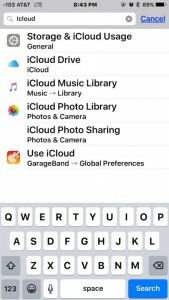 As you can see in the search example above, various iCloud settings are located in six different places within the Settings app. 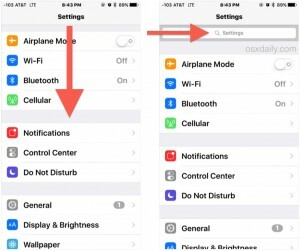 As iOS gains additional features and complexity, Settings Search becomes ever more useful, so the next time you’re wondering where to change a preference or make an adjustment, don’t forget this feature exists, it’s sure to make your life a bit easier. Of course, another option is to rely on Siri, though Siri is a bit more limited. Nonetheless, you can also open specific settings with Siri by making a request, and you can even have Siri make changes to some settings too by issuing a proper command too. Does your Apple Watch keep ending too soon because of accidental taps? If you play a sport or enjoy an activity that involves sweat and/or some sort of object brushing up against the screen of the Apple Watch, chances are you’ve accidentally ended a calculated workout too soon. It’s annoying, and thankfully there’s an easy way to prevent it: Locking the Apple Watch’s screen so that nothing but a Force Press will wake it from slumber. Here’s how. Open the Workout app on your Apple Watch and start a workout. In the Workout app, firmly press on the display. To unlock your screen, just firmly press on the display once more. and tap Unlock. Apple watchOS 2 update failing or frozen? Here’s the fix! 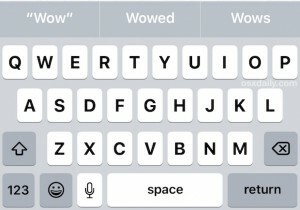 One change with iOS 9 is the introduction of a lowercased onscreen keyboard by default on iPhone and iPad, which while it can make it easier to identify when caps lock is enabled or disabled, it can also be a bit more difficult on the eyes for some users, particularly on the iPhone with a smaller display. 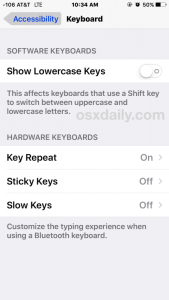 If you’d like to revert back to an uppercase keyboard again, which matches the keyboard styling on the vast majority of hardware keyboards and the keyboard in all versions of iOS prior to the 9.0 release, you can do so through a settings adjustment. If you want to test this, go to the Notes app and you’ll instantly see the difference, as the keyboard is now uppercase letters again, just like it was in all prior releases of iOS. 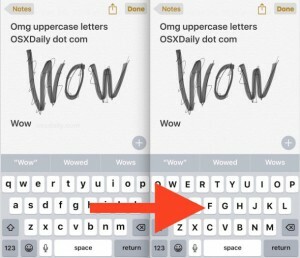 Whether or not you like the uppercase keyboard or the lowercase keyboard may depend on a variety of things, but for many users the uppercase keyboard is just easier to read and see, particularly if you use the bold text feature in iOS to further enhance the legibility of onscreen fonts and text. Of course if you decide you prefer the lowercase keyboard, you can always disable the uppercase keyboard again by going back into iOS settings and turning the lowercase keys back into the on position. By the way, while you’re adjusting keyboard settings, many users like to either enable or disable the keyboard click sound effects in iOS to suit their preferences too. If you find yourself needing to reset an Apple Watch to factory default settings, perhaps to erase personal data from it, to start fresh, for troubleshooting purposes, lending to someone else, for resale, or whatever else, you’ll discover the entire procedure is performed on the Apple Watch itself. That makes it a bit different from some of the other settings on the device which requires setup from an accompanying paired iPhone, but don’t worry, this is not difficult. Perhaps this should be obvious, but do be aware that by resetting an Apple Watch, you are completely erases everything off Apple Watch, including any media, data, settings, messages, pairing to iPhones, and anything else. Once you confirm the reset, a spinning wait indicator will appear on the screen for quite some time, eventually followed by an  Apple logo with an indicator around that. 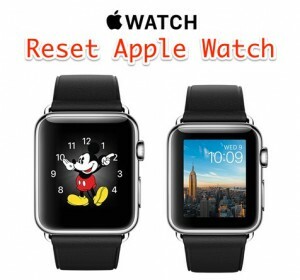 When the Apple Watch has finished erasing all data on the device, the reset Watch will appear as if it was brand new, booting up and asking to be paired with an Apple Watch to complete the initial setup again. The Watch will reset to whatever the version of WatchOS is that it’s installed, it does not downgrade WatchOS or do anything else with the operating system itself. Remember, this also removes any existing pairing between an Apple Watch and an iPhone, so that setup process has to start over again, even for a set of devices that were already synced to one another. This process is pretty similar to performing a factory reset in iOS, and it basically restores the device back to its factory default settings as if it were brand new. If you have attempted to enable backup encryption in iTunes for an iPhone, iPad, or iPod touch, you may encounter this fairly frustrating error message; “The password you entered to protect your iPhone backup could not be set. Please try again.” Assuming you do try again, you wind up in an endless loop of entering a password that iTunes refuses to accept for setting for the encrypted backup. With virtually no lead on how to resolve the error other than an infinite loop of entering passwords and seeing the same dialog again, it’s easy to get frustrated and give up on encrypting the backup, but you don’t need to do that, as it turns out there’s usually a fairly simple solution to fixing this ‘password could not be set’ error message, though it’s certainly not even close to obvious. At this point the message should not appear again, and here’s the reason why: the iPhone has been connected to iTunes via USB, an apparent necessity for setting an encrypted backup password. It will not set over the wi-fi syncing connection. Despite there being no hint in that direction, you must have the device connected with a physical USB cable for it to work. Curiously, sometimes the device will be connected with USB when the warning first appears, which is why we’re quitting iTunes and disconnecting and reconnecting the USB connection again, as that seems to resolve the attempt at using wi-fi syncing instead of the physical connection. Indeed this is a bit weird and not at all intuitive from the error message, but toggling the USB connection and setting the password as usual will resolve things. By the way, you should absolutely use the encrypted backup feature for iPhone backups, otherwise your backups to iTunes won’t be as complete as you may think they are – missing passwords, health information, and the personal data. You must use encrypted backups in order to have those pieces backed up successfully to iTunes, though that is not the case with iCloud backups as those are encrypted automatically. 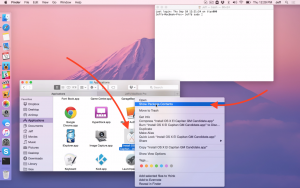 Now that the final GM version of OS X El Capitan is released, it’s time to revisit how to create a USB install disk. Chances are high this GM seed will be the same version of OS X that ships later this month on September 30th. Not only is the OS X 10.11 GM available to registered Apple developers, but it’s also available via Apple’s public beta program. With this in mind, you may now deem it the appropriate time to take the plunge, if you already haven’t thus far. 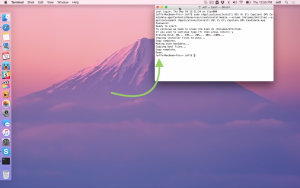 In this post, we’ll show you how incredibly simple it is to create an OS X El Capitan USB install disk from scratch. All you need is a USB disk with at least 8GB of storage space. Following thus tutorial will completely erase the contents of the USB flash drive, so make sure you are okay with this, or at least backup the contents of the drive somewhere else before proceeding. The process also takes quite a while once it’s initiated. We’re talking nearly 25 minutes to complete the process. 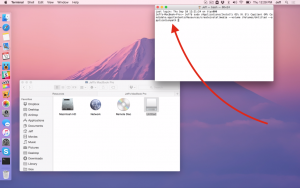 While we show you how to make an install disk using the OS X El Capitan GM seed, this tutorial will also work on the final version of El Capitan that’s released on the Mac App Store. 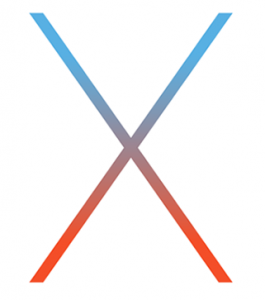 Step 1: Download El Capitan from the Mac App Store. 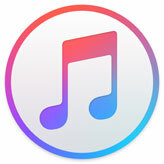 If you’re a developer, you can redeem a download code to use via the Apple developer center. If you’re a part of Apple’s public beta program, you can likewise redeem a code for the El Capitan GM via Apple’s beta website. Once El Capitan is released on the Mac App Store, you can download it there for free without needing any special redemption codes. 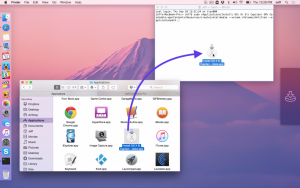 Step 2: Open Finder → Applications and right-click on Install OS X El Capitan GM Candidate.app and select Show Package Contents. From there, go to Contents → Resources. Step 3: Open a Terminal window and type sudo followed by a space. Step 4: Drag and drop createinstallmedia from the Finder into the Terminal window. Step 5: Type --volume in the Terminal followed by a space. 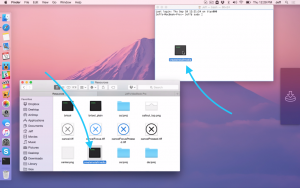 Step 6: Open Finder and click Go → Computer in the menu bar. Step 7: Drag and drop the USB disk into the Terminal window. Step 8: Type --applicationpath in the Terminal followed by a space. Step 9: Open Finder → Applications and drag and drop the Install OS X El Capitan GM Candidate.app to the Terminal. Step 10: Press Return on your keyboard while inside the Terminal. Step 11: Type a ‘Y’ to continue when prompted and press Return on your keyboard. Step 12: The process will begin by erasing the contents of your disk and copying the installer files to disk. As I stated at the outset, this process takes about 25 minutes or so, give or take a few minutes. Once your disk is created, you can simply eject the disk and save it for when you need it. If you’d like to use it to install OS X, we’ll show you how to do just that in an upcoming tutorial. Have you downloaded the GM yet? Are you planning on creating a USB installation disk?